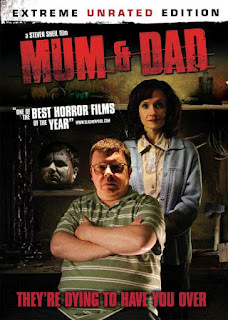 So here’s a fun one, Mum and Dad is the story of a young woman who has been kidnapped by a sadistic family. We really get the full range of shock and disgust with this one. There were parts that were done well and many parts that weren’t. Right out of the gate I was bored and a little annoyed by how hard it was to understand them. That might be the American in me. I really wasn’t expecting much and I was surprised. This is not what I would call a good movie but it did creep me out. I always have respect for a film that can shock me, but there is so much more to filmmaking than that. So they nailed that part of it, what about the rest? My first issue was something I’ve seen way too many times: victim gets knocked out and the scene fades out as she loses consciousness, the next scene starts when she wakes up. Is there no other way to film this? Maybe follow the assailant around a bit to see some more nastiness, just a thought. Secondly, they kept showing us footage of planes leaving from a close by airport. In fact, they showed it so frequently I was just about convinced she would be escaping by plane. I get the symbolism, but honestly it was too much. We get it. On the positive side of things, there was one character interesting enough to keep me watching. The father was by far the most foul and vile of the group, but I enjoyed almost every moment of him on screen. Something about him reminded me of Bob Hoskins only much more sinister. The rest of the family just didn’t do it for me. The daughter was a brat and more than annoying, the mom wasn’t too bad but still lacking, and the slow son made decisions that just didn’t really make sense to me. As for our survivor girl, if she had just played the game things would have come out much better for her. I understand panic, but I don’t understand not thinking at all the entire time. If you want to see what your gross-out limit is, go for it. If you want something more than shock cinema, go watch The Woman. Here’s to hoping this director will give us a more mature product on his next try.